Why do you regard the issue of male and female roles as so important? What do you mean by "unbiblical female leadership in the church" (in question 1)? Where in the Bible do you get the idea that only men should be the pastors and elders of the church? What about marriage? What do you mean by "marriage patterns that do not portray the relationship between Christ and the church" (in question 1)? What do you mean by "submission" (in question 4)? What do you mean when you call the husband "head" (in question 5)? Where in the Bible do you get the idea that husbands should be the leaders in their homes? When you say that a wife should not follow her husband into sin (question 5), what's left of headship? Who is to say what act of his leadership is sinful enough to justify her refusal to follow? Don't you think that stressing headship and submission gives impetus to the epidemic of wife abuse? But don't you believe in "mutual submission," which Paul seems to teach in Ephesians 5:21 ("submitting to one another")? If "head" means "source" in Ephesians 5:23 ("the husband is the head of the wife"), as some scholars say it does, wouldn't that change your whole way of seeing this passage and eliminate the idea of the husband's leadership in the home? Isn't your stress on leadership in the church and headship in the home contrary to the emphasis of Christ in Luke 22:26, "Let the greatest among you become as the youngest, and the leader as one who serves"? In questions 2 and 6, you said that the calling of the man is to bear "primary responsibility" for leadership in the church and the home. What do you mean by "primary"? If the husband is to treat his wife as Christ does the church, does that mean he should govern all the details of her life and that she should clear all her actions with him? Don't you think that these texts are examples of temporary compromise with the patriarchal status quo, while the main thrust of Scripture is toward the leveling of genderbased role differences? Aren't the arguments made to defend the exclusion of women from the pastorate today parallel to the arguments Christians made to defend slavery in the nineteenth century? Since the New Testament teaching on the submission of wives in marriage is found in the part of Scripture known as the "household codes" (Haustafeln), which were taken over in part from first-century culture, shouldn't we recognize that what Scripture is teaching us is not to offend against current culture but to fit in with it up to a point and thus be willing to change our practices of how men and women relate, rather than hold fast to a temporary first-century pattern? But what about the liberating way Jesus treated women? Doesn't he explode our hierarchical traditions and open the way for women to be given access to all ministry roles? Doesn't the significant role women had in ministry with Paul show that his teachings do not mean that women should be excluded from ministry? But Priscilla taught Apollos, didn't she (Acts 18:26)? And she is even mentioned before her husband, Aquila. Doesn't that show that the practice of the early church did not exclude women from the teaching office of the church? Are you saying that it is all right for women to teach men under some circumstances? Can't a pastor authorize a woman to teach Scripture to the congregation and then continue to exercise oversight while she teaches? How can you be in favor of women prophesying in church but not in favor of women being pastors and elders? Isn't prophecy at the very heart of those roles? Are you saying, then, that you accept the freedom of women to prophesy publicly as described in Acts 2:17; 21:9; and 1 Corinthians 11:5? Since it says in 1 Corinthians 14:34 that "women should keep silent in the churches," it doesn't seem like your position is really biblical because of how much speaking you really do allow to women. How do you account for this straightforward prohibition of women speaking? Doesn't Paul's statement that "there is no male and female, for you are all one in Christ Jesus" (Gal. 3:28) take away gender as a basis for distinction of roles in the church? How do you explain God's apparent endorsement of Old Testament women who had prophetic or leadership roles? Do you think women are more gullible than men? But it does look as if Paul really thought Eve was somehow more vulnerable to deception than Adam. Wouldn't this make Paul a culpable chauvinist? If a woman is not allowed to teach men in a regular, official way, why is it permissible for her to teach children, who are far more impressionable and defenseless? Aren't you guilty of a selective literalism when you say some commands in a text are permanently valid and others, like "Don't wear braided hair" or "Do wear a head covering," are culturally conditioned and not absolute? But doesn't Paul argue for a head covering for women in worship by appealing to the created order in 1 Corinthians 11:13–15? Why is the head covering not binding today while the teaching concerning submission and headship is? How is it consistent to forbid the eldership to women in our churches and then send them out as missionaries to do things forbidden at home? Do you deny women the right to use the gifts God has given them? Does not God's giving a spiritual gift imply that he endorses its use for the edification of the church? If God has genuinely called a woman to be a pastor, then how can you say she should not be one? What is the meaning of authority when you talk about it in relation to the home and the church? If a church embraces a congregational form of governance in which the congregation, and not the elders, is the highest authority under Christ and Scripture, should the women be allowed to vote? In Romans 16:7, Paul wrote, "Greet Andronicus and Junia, my kinsmen and my fellow prisoners. They are well known to the apostles, and they were in Christ before me." Isn't Junia a woman? And wasn't she an apostle? And doesn't that mean that Paul was willing to acknowledge that a woman held a very authoritative position over men in the early church? Paul seems to base the primary responsibility of man to lead and teach on the fact that he was created first, before woman (1 Tim. 2:13). How is this a valid argument when the animals were created before man but don't have primary responsibility for leading him? Isn't it true that the reason Paul did not permit women to teach was that women were not well educated in the first century? But that reason does not apply today. In fact, since women are as well educated as men today, shouldn't we allow both women and men to be pastors? How do you know that your interpretation of Scripture is not influenced more by your background and culture than by what the authors of Scripture actually intended? Why is it acceptable to sing hymns written by women and recommend books written by women but not to permit them to say the same things audibly? Isn't giving women access to all offices and roles a simple matter of justice that even our society recognizes? Isn't it true that God is called our "helper" numerous times in the Bible with the same word used to describe Eve when she was called a "helper" suitable for man? Doesn't that rule out any notion of a uniquely submissive role for her, or even make her more authoritative than the man? Literally, 1 Corinthians 7:3–5 says, "The husband should give to his wife her conjugal rights, and likewise the wife to her husband. For the wife does not have authority over her own body, but the husband does. Likewise the husband does not have authority over his own body, but the wife does. Do not deprive one another, except perhaps by agreement for a limited time, that you may devote yourselves to prayer." Doesn't this show that unilateral authority from the husband is wrong? If you believe that role distinctions for men and women in the home and the church are rooted in God's created order, why are you not as insistent about applying the rules everywhere in secular life as you are in the home and the church? How can a single Christian woman enter into the mystery of Christ and the church if she never experiences marriage? 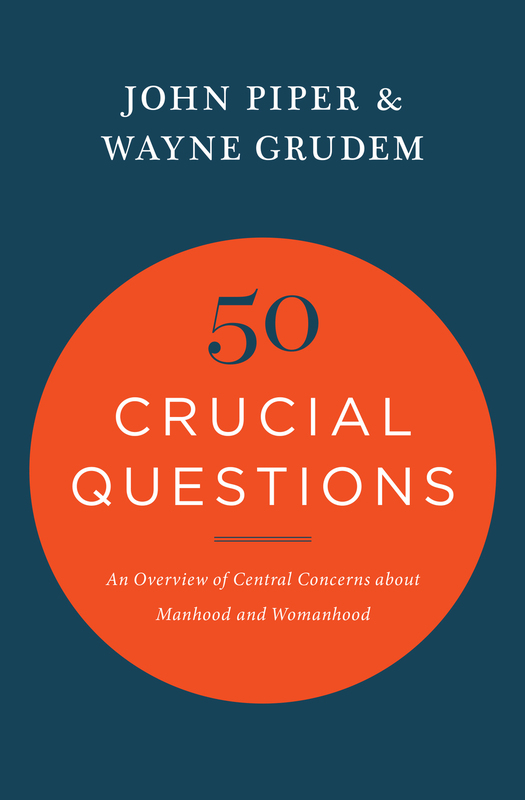 Since many leading evangelical scholars disagree on the questions of manhood and womanhood, how can any layperson even hope to come to a clear conviction on these questions? If a group of texts is hotly disputed, wouldn't it be a good principle of interpretation not to allow them any significant influence over our view of manhood and womanhood? Similarly, since there is significant disagreement in the church over the issue of men's and women's roles, should we not view this as having a very low level of importance in defining denominational, institutional, and congregational standards of belief and practice?